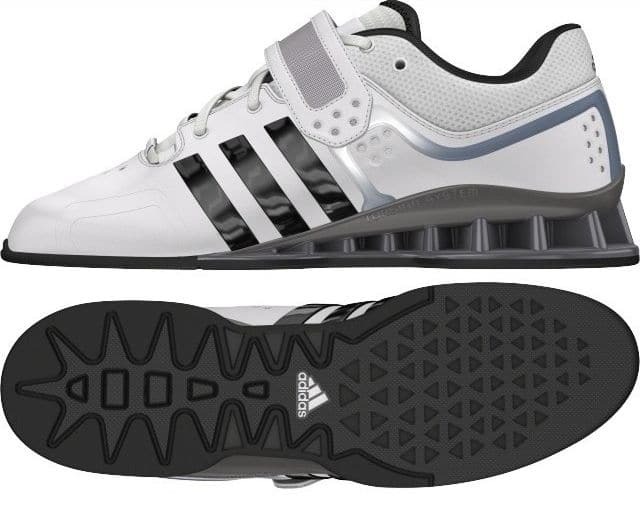 Since January 2014 rumors have been swirling of a White Adidas AdiPower weightlifting shoe set to come out this year. I just spoke with my contacts at Adidas and they are indeed preparing to release a white and gray model of the AdiPower. The estimated release date is scheduled for this Summer, with a June target. I also managed to find an nice digital illustration of the new shoe. The color ways appear to be predominantly white with possible silver accents and a medium gray heel. This will be a welcomed addition to the Adidas weight lifting shoe lineup and likely result in bigger market share. I know many lifters who wouldn’t buy the AdiPower when it came out because it was only available in the orangish-red “core power” color. This was also one of the few negative marks the shoe received in our reviews. The addition of more color options will also even the playing field against rival Nike’s Romaleo 2. I’ve been checking Adidas periodically for these to drop, and what do I notice tonight? They quietly came out with a black/red colorway before these white/greys! Well crap… I had a draft article written up talking about the new black/red design but I guess I’ll scrap it! Thanks for the update! From the photo it appears that they’ve added the first shoelace loop, again. Do you know if this is the case? The all red ones had the loops, the black lacked them and hopefully they’ve gone back to it with this model change. From the pictures it looks like they added the 1st row of lace loops back into this model. Good news and I’ll be buying a pair when they’re released. The new white adiPower weightlifting shoes do not have the cloth eyelet. Pictures of the actual production model can be seen on the Dynamic Fitness Equipment website. These shoes projected to be available between the last week of May to the first week of June. Is there any new information related to this white and gray model? I have the red ones. I like them, but they are a little “loud.” They’re like Ferraris for my feat! These look nice, though. Can anyone provide an update of when these will be released? Still no word besides the Summer. A Norwegian site has recently put them up as coming soon, in addition to dynamicfitness, so maybe within the next month or so? They are available on dynamic fitness now!